The 2ft Double Slatted Diamond Lattice from Forest is an attractive arrangement between the traditional garden lattice and trellis styles. 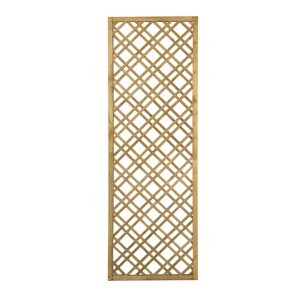 Dual slats are arranged diagonally across the frame, creating a striking pattern of geometric shapes and with the use of twin slats rather than the normal single slat design this lattice becomes a strong and robust panel. The 7.5mm thick x 17mm wide smooth-planed and rounded slats are secured in place by a high quality, smooth-planed, rebated frame. This decorative lattice is perfect for mounting horizontally or vertically to an external wall or fence and provides beautiful framework for training climbing plants such as Roses, Ivy or Clematis. Manufactured in Poland from FSC certified timber from sustainable sources this mixed softwood lattice is pressure treated which gives a natural timber colour and provides the lattice with a 15 year anti-rot guarantee, eliminating the need for annual re-treatment.